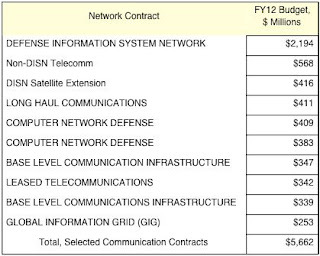 Paul Strassmann’s blog: What are DoD’s Largest Cost Reduction Opportunities? What are DoD’s Largest Cost Reduction Opportunities? With renewed emphasis on cost reduction, this tabulation offers a view of what could be the best candidates for cost reductions. 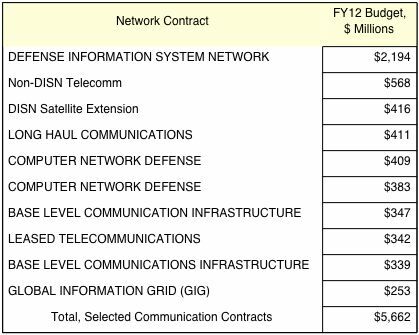 It shows that the DoD total IT the infrastructure costs are 62% of the total. These costs are almost entirely Operations and Maintenance expenses, which are more amenable to rapidly changing technology and manpower budgets. Therefore the primary target should the highly expensive and fractured DoD infrastructure. The question is how to cut either the data center operations costs ($6.5 billion for support plus $2.5 billion hardware), or telecommunications costs ($9.9 billion). Of the two cost cutting opportunities, reducing telecommunications costs offers greater potential and less risk because it is simpler. It involves a much small number of organizations that control spending. The most frequently cited cost reduction initiatives propose major reductions in the number of data centers. This is done through a four-fold increase in hardware utilization by means of virtualization. That requires capital investments for new equipment. Squeezing 5,000+ applications into a smaller number of servers involves spending on fixing up applications. Data center operating personnel costs are least twice as much expensive as the expense for mainframe and servers. Shutting down installations takes time and involves termination of special purpose buildings, air-conditioning and the supply of electric power. Most importantly, regardless of the number of data centers there will be a need for for continued use of trained operators who know how to deal with local security and operating requirements. Such staff is hard to terminate. Achieving cost reductions through consolidation of data centers is attractive but takes a long time for payoffs to materialize. It has greater risks and a longer time before the Return-on-Investment (ROI) becomes positive. The last major effort to reduce IT costs in DoD was the DMRD 918 in 1993. It took more than ten years to complete. Financial paybacks still remain uncertain. While this effort consolidated 142 DISA data centers into nine, several hundred new data centers sprung up elsewhere. A better opportunity for cost reduction is the $9.9 billion telecommunication cost. There is an estimated 15,000 networks in place. They are already connected through switches and routers that can be reorganized for control by a fraction of the current staff. The number of communication contracts is much smaller than the number of involved in data centers. Communication contracts are already managed by DISA. Enterprise-wide unification should be easier because contracts are for services rather than for ownership. The contractors should own capital costs. Consolidations of data centers will have an effect on the structure of communications. First, placing servers into a few locations as a hub cloud service will increase the flow of traffic. Second, concentration of computing will increase the importance of capacity used for sharing data processing across cloud operations. This will add to the volume of redundant transactions. Proceeding with data center consolidation without the redesign of communications will produce an increase in costs. It will also slow down the rate at which data center consolidation can proceed. 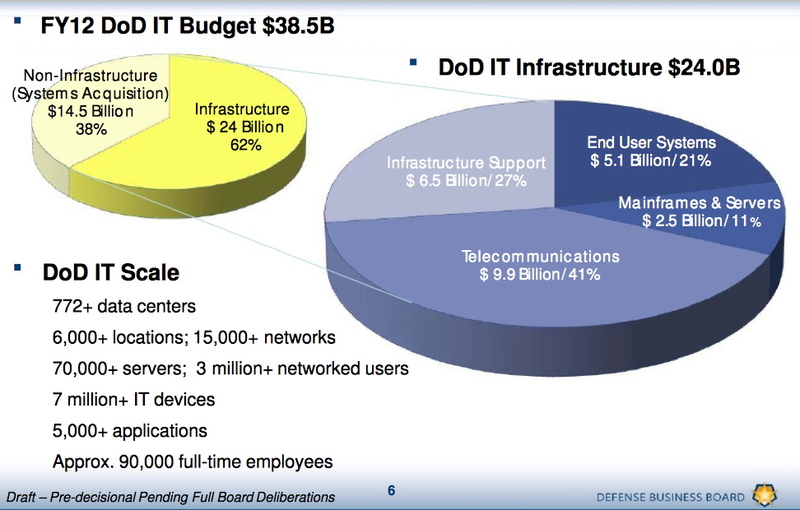 The major challenge for the DoD CIO is to pick the priorities how to achieve cost reductions. It has not been demonstrated that the prevailing emphasis on the reduction in the number of data centers will be the most effective solution. The dollars in potential savings as well as the technical difficulties do not place the cutting in the numbers of data centers on the top savings potentials. Most likely the way to start on savings should be through the restructuring of communication networks.